The Church is just over a mile south west of the present village centre, the village having grown away from the church as a result of the arrival in the area of the railway in 1860. The structure and growth of the parish changed dramatically in the second half of the 19th century when the previous essentially rural village became a bustling, vibrant community established around the station. Apart from the railway Colwall also benefitted from its position on the western side of the Malvern Hills and its nearness to Malvern which at that time was a very fashionable spa and water cure centre. A church has been on this site since Saxon times serving a farming community where agricultural activities included hunting on the local chase. The first Rector listed was Gerard de Eugines in 1275 and at that time the church would have consisted of a chancel, the nave and the south aisle. Entry to the existing church is through a late Norman south doorway with colonettes having trumpet-scallop capitals. The south aisle with a 5 bay arcade is 13th century and projecting south from the west end of the aisle is the tower began in the 14th century with a 15th century top. 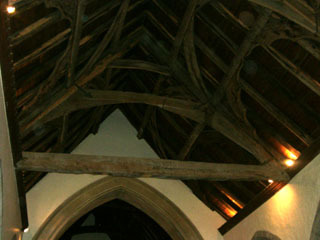 There is a handsome nave roof which was significantly repaired around 1675 when the great tie beam was positioned to strengthen the leaning pillars. Features to note in the roof include the collar-beams on arched braces with two tiers of curved wind braces, the lower being cusped to form sexfoiled arches. 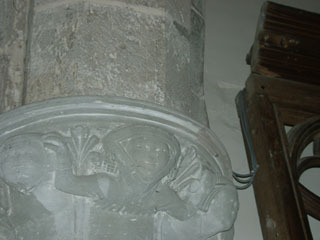 On the half-pillar in the west wall the central figure has raised arms and probably represents a fertility symbol which country folk felt important even after they became Christians. There are two interesting memorials. One, a stone coat of arms dated 1587 on east wall to the parents of Humphry Walwyn, a member of the Worshipful Company of Grocers in London and a notable benefactor to Colwall. In 1614 he left a legacy to fund a free Grammar School in the village and it has survived though now known as the Elms School, an independent preparatory school. 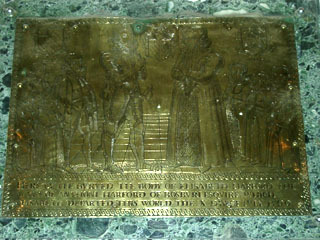 The second memorial is an engraved brass tablet on the south wall to Elizabeth Harford who died in 1590, mourned by her husband, six sons and four daughters. The north aisle was built in 1880 mainly to accommodate children from the Grammar School and some of the pews are still marked "Grocer School". 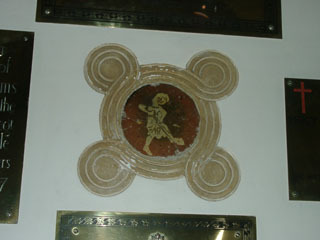 On the north wall there is a 13th century tile, probably one of 12 covering local rural monthly activities, representing March showing a man digging. The chancel is Victorian, having been rebuilt and enlarged in 1865 by Woodyear in Early English style. The Nicholson organ, church plate and chancel furnishings also date from this period. 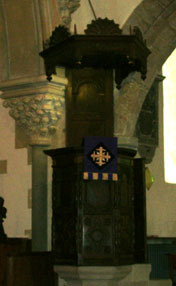 The pulpit is Jacobean with blank arches and preserved back panel and tester. The tower is an active bell tower which, notably for a village parish, has a ring of 10 bells following a major renovation project as part of the Millennium celebrations. The church stands in an interesting churchyard.